The use of iodinated radiocontrast agents to delineate normal structures for diagnostic or therapeutic purposes represents a major advancement in the field of medical imaging. The use of intravascular contrast media (CM) has been increasing steadily over the past few years with different types each claiming to minimize the side effects. Contrast-induced nephropathy (CIN) is one of the common and serious adverse effects of the procedures using CM. Various studies have reported the incidence of CIN to be between 2% and 50%, depending on the definition of CIN.,, CIN is the third most common cause of “in-hospital” acute kidney injury (AKI), after hypotension and surgery. CIN is a preventable cause of AKI, and hence it is imperative to ensure the judicious use of CM in patients to prevent the associated complications. Coronary angiography (CAG) for diagnostic or therapeutic purposes such as percutaneous coronary intervention (PCI) is one of the common procedures which require the use of intravenous CM. The reported incidence of CIN in high-risk patients following CAG varies from 10% to 20%. 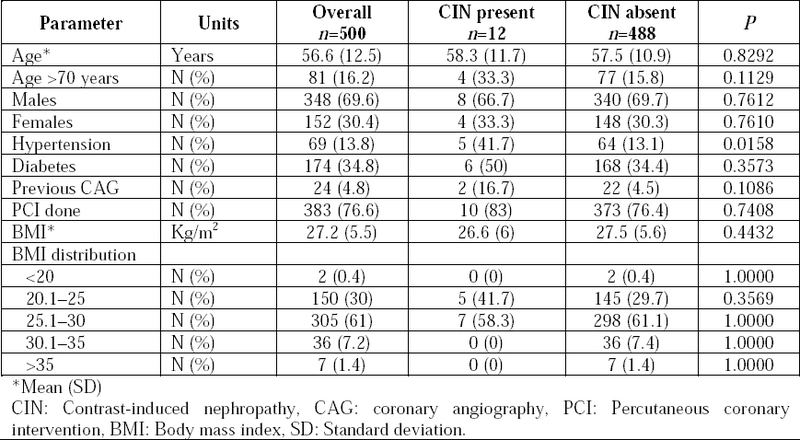 The high rate of CIN in post-PCI patients could be related either to the patient (advanced age, previous CKD, diabetes, dehydration, and concomitant use of other nephrotoxic drugs) or procedure related (intra-arterial route of administration, use of high osmolar CM, repeated exposure to contrast within 48 h, volume of contrast used, etc.). The prevention of CIN is of paramount importance, with an ever increasing number of CAGs and PCIs being done on an outpatient basis. 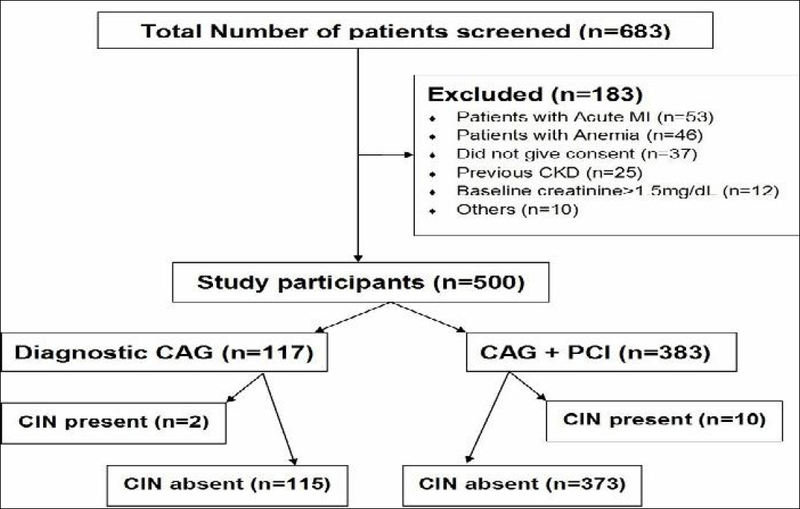 We conducted this study to detect the incidence of CIN in patients undergoing CAG with an aim to identify the subset of patients who are at high risk for CIN after cardiac catheterization and PCI. This was a prospective study carried out at a tertiary care center located in northern part of India on 500 Indian patients who underwent CAG between March 2014 and June 2015. The flow diagram of the study participants is given in [Figure 1]. We included all patients with normal renal parameters undergoing CAG with nonionic radiocontrast media. We excluded patients with known chronic kidney disease, baseline creatinine more than 1.5 mg/dL, significant hypotension, anemia, and patients with acute myocardial infarction undergoing emergency PCI. Patients were screened for CIN by evaluating their serum creatinine procedure and on day 3, 4, 5, and 7 after the procedure. The study population (n = 500) was divided into two groups: Group 1 (patients who developed CIN, n = 12) and Group 2 (patients without CIN, n = 488). CIN was defined as a relative (≥25%) or an absolute increase (≥0.5 mg/dL) in serum creatinine at 48 h from the patient’s baseline value following the exp9 osure to CM in the absence of any other cause. At the time of admission, blood samples were tested for hematological and biochemistry panel. Urinalysis was carried out in all patients, and ultrasonography of kidneys, ureters, and bladder was done. Nephrotoxic drugs if any, being used, and metformin was stopped 24 h before the procedure. Each patient’s hydration status was assessed by clinical bedside tests such as skin turgor, mucous membrane hydration, pulse, and blood pressure. Oral hydration was used to correct the hydration status of any patient found to be inadequately hydrated. Diabetic patients were only taken up once their glycemic control was adequate (fasting glucose <130 mg/dL and postprandial glucose <180 mg/dL). CAG was performed in the Cardiac Catheterization Laboratory by Cardiologist using the Philips biplane equipment. PCI, when indicated, was also done for all patients during the procedure. Tri-iodinated nonionic monomeric water-soluble radiocontrast (Omnipaque™ manufactured by GE Healthcare, which contains iohexol) was used as the CM. Its iodine content is 350 mg/L, osmolality is 780 mOsm/ kg H2O, and viscosity at 37°C is 10.6 mPa. The volume of contrast used was dictated by the procedure being carried out on each patient and at the discretion of the cardiologists based on standard guidelines. The volume of contrast given to each patient was <5 × [body weight (in kg)/serum creatinine (in mg/dL)] as has been described as the upper safe limit previously. All intraprocedural events were recorded with special reference to hypotension. Postprocedure, every patient remained hospitalized for at least 72 h during which time, they were managed as per the standard postcardiac catheterization protocol of the hospital with strict immobilization of the limb and regular monitoring of vital parameters. All patients were hydrated adequately as per the standard protocol, and no nephrotoxic drugs were used in them postcontrast exposure. Any patient, who developed CIN, was monitored in-hospital with serial kidney function tests and urine output record, besides ensuring adequate hy-dration and preventing the use of any nephrotoxic drugs among them, until they recovered renal function. Data are presented as a mean and standard deviation or numbers with percentages. Comparison between the groups was done using Mann-Whitney test, and Fisher’s exact test was used for the frequency estimation. A twotailed P <0.05 is considered statistically significant for all the tests. The statistical analysis and graph generation were done using GraphPad Prism Software version 6 (GraphPad Software, San Diego, California, USA). We evaluated a total of 683 patients out of which 500 were included in the study. Of the total, 348 (69.6%) were males and 152 (30.4%) were females. Mean age of patients was 56.6 ± 12.5 years. The baseline characteristics of the patients are shown in [Table 1]. Twelve patients (2.4%) developed CIN in the entire study population. [Table 1] also provides the detailed differentiating features between the patients with and without CIN. Briefly, the incidence of CIN was equally distributed among the various strata of BMI, patients who underwent PCI during the angiography procedure, and in patients with comorbid ailments such as diabetes. CIN was observed to be more common in patients with hypertension than in those without hypertension (P = 0.0158). Elderly patients were also not observed to have an increased incidence of CIN compared to rest of the population. Table 1: Baseline parameters and comparison between patients with and without CIN. Descriptive analysis of the volume of contrast was also done to determine the role of volume of CM in the genesis of CIN. The mean volume of contrast given to patients in this study was 159.5 ± 56.1 mL. Patients who underwent intervention were given a significantly higher volume of CM (187.8 ± 23.2 mL) compared to those who did not undergo intervention (66.9 ± 22.2 mL; P <0.001). However, the difference in volume of contrast administered to CIN group (175 ± 59.3) was not significant as compared to that of non-CIN (159.1 ± 56) group (P = 0.334). None of the patients in our study required renal replacement therapy, and there was no mortality. Serial monitoring of creatinine in the CIN group showed that all the patients had normal kidney function by the end of day 7 as shown in [Figure 2]. Figure 2: Trendline of serum creatinine. Our study showed 2.4% incidence of CIN in patients undergoing CAG, which is similar to that of previous studies.,, Rihal et al found an overall incidence of 3.3% in their series of 7586 patients who underwent cardiac catheterization. The risk of CIN in their patients with normal renal function was 2.4%. Few authors have shown a significantly higher incidence of CIN in patients undergoing contrast-related procedures ranging from 5% to 15%. The stringent exclusion criteria employed in our study could have contributed to the low incidence of CIN in comparison to other studies., We excluded patients with preexisting CKD and a baseline creatinine more than 1.5 mg/dL, whereas other authors have included these patients in their study.,, Moreover, the mean volume of contrast used in our study (160 mL) was significantly lower than that in the studies mentioned above (240–290 mL). Another important observation of our study is the self-limiting course of the CIN in all patients without the requirement of renal replacement therapy. A similar observation was noted by Lautin et al, but this is in contrast to many previous studies of CIN.,, Multiple factors could explain this observation including careful patient selection, minimal use of CM, avoidance of nephrotoxic drugs, and ensuring proper hydration in the postprocedure period. Advanced age has been demonstrated to be a risk factor for the occurrence of CIN. However, despite the incidence of CIN in the elderly being higher than that in the younger individuals in our study (4.9% vs. 2.4%), it did not achieve statistical significance (P = 0.10) due to above-mentioned factors. Previous studies did not show ethnicity as an independent risk factor for the occurrence of CIN., Our study population consists of Indians only, and the data may be applicable to other South Asians for the genetic and metabolic similarities between them. Our study is also consistent with that of many studies, who found the presence of hypertension to be a significant risk factor for the occurrence of CIN., The role of hypertension in predisposing to CIN can be associated with advanced atherosclerosis of the aorta and suggests that atheroembolization to the kidney during CAG may also be an important cause of AKI. Hypertension-induced endothelial injury could be one of the predisposing factors for the CIN, which is being studied further in animal models. Our study showed no difference in the incidence of CIN in patients who had undergone prior CAG or PCI similar to the earlier studies. Further studies with larger sample size are required to confirm any association between the CIN and prior CAG or PCI. In this study, apart from hypertension, none of the other conventional risk factors such as advanced age, diabetes, and volume of contrast were found to have a significant association with incidence of CIN. This could be due to a small number of patients (12 out of 500) having CIN in our study. Parfrey et al showed that diabetes patients with preserved renal function had a comparable rate of CIN to that of a healthy population. We included patients with good glycemic control and ensured adequate hydration which are the best measures for prevention of CIN associated with diabetes. Patients with PCI did not have a higher incidence of CIN despite receiving a higher CM dose due to the smaller volume of CM used than in other studies. This observation emphasizes that preexisting renal compromise and comorbid ailments play an important role in the development of CIN other than the type and quantity of CM. The current definition of the CIN is based on the absolute or relative increase in the serum creatinine. The creatinine may not actually reflect the underlying kidney function and give an accurate prediction of the glomerular filtration rate (GFR). Cystatin C is considered as a more robust marker for the estimation of GFR and may be useful in monitoring for the CIN. The strengths of our study include careful selection of patients, judicious use of CM, documented follow-up in a tertiary level multidisciplinary care setup, and highlighting the simple measures such as adequate hydration, withdrawal of nephrotoxic agents, and careful monitoring of the patients. The limitations of our study include small sample size, data derived from a single hospital may not be applicable to other centers, and a small number of CIN patients in the sample. Our data being derived from Indian patients may not be applicable to patients of other race and ethnicity. To conclude, CIN is a potential risk factor for all patients undergoing diagnostic or therapeutic procedures with radiocontrast media. Our study demonstrates that the incidence of CIN could be reduced by proper prescreening, prevention of hypotension, good glycemic control, and adequate hydration. The genetic makeup of the patients in the study could also contribute to the risk potential which requires further research. The goal of the clinician is to prevent CIN justifying the old idiom of “prevention is better than cure.” Simple measures such as adequate hydration and proper monitoring are enough in most of the cases with only a few patients of CIN requiring the renal replacement therapy. Berg KJ. Nephrotoxicity related to contrast media. Scand J Urol Nephrol 2000;34:317-22. Gleeson TG, Bulugahapitiya S. Contrast-induced nephropathy. AJR Am J Roentgenol 2004;183:1673-89. Hou SH, Bushinsky DA, Wish JB, Cohen JJ, Harrington JT. Hospital-acquired renal insufficiency: A prospective study. Am J Med 1983;74:243-8. Nough H, Eghbal F, Soltani M, et al. Incidence and main determinants of contrast-induced nephropathy following coronary angiography or subsequent balloon angioplasty. Cardiorenal Med 2013;3:128-35. McCullough PA, Wolyn R, Rocher LL, Levin RN, O’Neill WW. Acute renal failure after coronary intervention: Incidence, risk factors, and relationship to mortality. Am J Med 1997; 103:368-75. Dangas G, Iakovou I, Nikolsky E, et al. Contrast-induced nephropathy after percutaneous coronary interventions in relation to chronic kidney disease and hemodynamic variables. Am J Cardiol 2005;95:13-9. Toprak O, Cirit M. Risk factors for contrast-induced nephropathy. Kidney Blood Press Res 2006;29:84-93. McCullough PA. Multimodality prevention of contrast-induced acute kidney injury. Am J Kidney Dis 2008;51:169-72. Mehran R, Nikolsky E. Contrast-induced nephropathy: Definition, epidemiology, and patients at risk. Kidney Int Suppl 2006; 100:S11-5. Thomsen HS. Guidelines for contrast media from the European Society of Urogenital Radiology. AJR Am J Roentgenol 2003;181: 1463-71. Trivedi HS, Moore H, Nasr S, et al. A randomized prospective trial to assess the role of saline hydration on the development of contrast nephrotoxicity. Nephron Clin Pract 2003;93:C29-34. Lin YS, Fang HY, Hussein H, et al. Predictors of contrast-induced nephropathy in chronic total occlusion percutaneous coronary intervention. EuroIntervention 2014;9:1173-80. Goldenberg I, Matetzky S. Nephropathy induced by contrast media: Pathogenesis, risk factors and preventive strategies. CMAJ 2005; 172:1461-71. Shemirani H, Pourrmoghaddas M. A randomized trial of saline hydration to prevent contrast-induced nephropathy in patients on regular captopril or furosemide therapy undergoing percutaneous coronary intervention. Saudi J Kidney Dis Transpl 2012;23:280-5. Rihal CS, Textor SC, Grill DE, et al. Incidence and prognostic importance of acute renal failure after percutaneous coronary intervention. Circulation 2002;105:2259-64. Habib M, Hillis A, Hammad A. Nacetylcysteine and/or ascorbic acid versus placebo to prevent contrast-induced nephropathy in patients undergoing elective cardiac catheterization: The NAPCIN trial; A single center, prospective, randomized trial. Saudi J Kidney Dis Transpl 2016;27:55-61. Gruberg L, Mintz GS, Mehran R, et al. The prognostic implications of further renal function deterioration within 48h of interventional coronary procedures in patients with pre-existent chronic renal insufficiency. J Am Coll Cardiol 2000;36:1542-8. Lautin EM, Freeman NJ, Schoenfeld AH, et al. Radiocontrast-associated renal dysfunction: A comparison of lower-osmolality and conventional high-osmolality contrast media. AJR Am J Roentgenol 1991;157:59-65. Solomon RJ, Mehran R, Natarajan MK, et al. Contrast-induced nephropathy and long-term adverse events: Cause and effect? Clin J Am Soc Nephrol 2009;4:1162-9. Roghi A, Savonitto S, Cavallini C, et al. Impact of acute renal failure following percutaneous coronary intervention on long-term mortality. J Cardiovasc Med (Hagerstown) 2008;9:375-81. Merten GJ, Burgess WP, Gray LV, et al. Prevention of contrast-induced nephropathy with sodium bicarbonate: A randomized controlled trial. JAMA 2004;291:2328-34. Prasad V, Gandhi D, Stokum C, Miller T, Jindal G. Incidence of contrast material induced nephropathy after neuroendovascular procedures. Radiology 2014;273:853-8. Ankala A, Tamhankar PM, Valencia CA, Rayam KK, Kumar MM, Hegde MR. Clinical applications and implications of common and founder mutations in Indian subpopulations. Hum Mutat 2015;36:1-10. Nikolsky E, Mehran R, Lasic Z, et al. Low hematocrit predicts contrast-induced nephropathy after percutaneous coronary interventions. Kidney Int 2005;67:706-13. Guitterez NV, Diaz A, Timmis GC, et al. Determinants of serum creatinine trajectory in acute contrast nephropathy. J Interv Cardiol 2002;15:349-54. Alamartine E, Phayphet M, Thibaudin D, Barral FG, Veyret C. Contrast medium-induced acute renal failure and cholesterol embolism after radiological procedures: Incidence, risk factors, and compliance with recommendations. Eur J Intern Med 2003;14: 426-431. Beierwaltes WH. Endothelial dysfunction in the outer medullary vasa recta as a key to contrast media-induced nephropathy. Am J Physiol Renal Physiol 2013;304:F31-2. Parfrey PS, Griffiths SM, Barrett BJ, et al. Contrast material-induced renal failure in patients with diabetes mellitus, renal insufficiency, or both. A prospective controlled study. N Engl J Med 1989;320:143-9. Brown JR, Robb JF, Block CA, et al. Does safe dosing of iodinated contrast prevent contrast-induced acute kidney injury? Circ Cardiovasc Interv 2010;3:346-50. Khatami MR, Nikravan N, Salari-Far M, Davoudi S, Pahlavan-Sabbagh MR. A comparison of definitions of contrast-induced nephropathy in patients with normal serum creatinine. Saudi J Kidney Dis Transpl 2016;27:94-100. Al-Beladi FI. Cystatin C is an early marker of contrast-induced nephropathy in patients with sepsis in the intensive care unit. Saudi J Kidney Dis Transpl 2015;26:718-24.